Are Jewish composers of classic Christmas songs resented by Christians? Darlene Love fronts Saturday Night Live's, Rob Smigel's Phil Spector-esque, "Rudolph the Red-nosed Reindeer-style music video," from Saturday TV Funhouse - "Christmas-time for the Jews"
Since Bing Crosby crooned Irving Berlin's "White Christmas" in 1941, Jewish songwriters and singers have played an integral role in the creation of new Christmas music year in and year out. ...all those lousy holiday songs by Jewish guys that trash up the malls every year, Rudolph and the chestnuts and the rest of that dreck. Did one of our guys write "Grab your loafers, come along if you wanna, and we'll blow that shofar for Rosh Hashanah"? No, we didn't. Christmas is a Christian holiday - if you're not in the club, then buzz off. Not sure what this has to do with one church's rendition of "Silent Night," which, though rumors have floated around about it, was not written by a Jew. Perhaps the culture wars are not quite over. Happy holidays, Mr. Keillor. (IFF's editor is hoping for the loafers/shofar song to get wide airplay in September--though with that kind of slant rhyme, Keillor is clearly no Irving Berlin)." (By Aaron Klein) – Jewish residents of a rocket-battered city outside the Gaza Strip every day this week lit a Hanukkah menorah fashioned out of hollowed Palestinian Qassam rockets that had been shot at their town. "This is a symbol to our enemies that despite thousands of rockets fired at Sderot, our spirit has not broken. We are here to stay," said Josh Hasten, spokesman for Yeshiva Hesder Sderot, a Jewish school that combines Torah study with army service. Deputy Foreign Minister Danny Ayalon publishes Arabic letter to Arab world: "Israel extends its hand in peace"
Deputy Foreign Minister Danny Ayalon (Yisrael Beitenu) published the following op-ed in pan-Arab newspaper a-Sharq Alawsat on Tuesday: "Israel extends its hand in peace"
... The Iranian regime has many tentacles spread out across the region sowing destruction and despair amongst the people. The enemy of the people of Lebanon is not Israel, but Hizbullah. The enemy of the Palestinian people is not Israel, but Hamas. The enemy of the Egyptian people is not Israel, but militant Islamist opposition groups. All of these groups, and many others, receive their commands from Iran, who wish to control and suppress any aspirations the region has towards freedom and advancement. A self-identified Turkish Muslim returned for the second week in a row Saturday night to hack the popular Five Towns Jewish Times newspaper website. Readers of the site were met with a picture of the Statue of Liberty holding a Muslim holy book (likely the Koran) dressed in a burka, the Moslem robe that covers the body. Saturday evening on December 12th, readers attempting to access the site saw images of burning Israeli flags and a video demonizing former Prime Minister Ariel Sharon. "Where were the Palestinians when ..." in Hudson Institute. 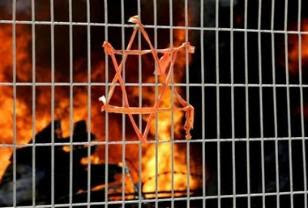 "Condemnations for the (West Bank) Yasuf arson have come from across the political spectrum in Israel. The Israeli president, prime minister, defense minister, religious and secular leaders and even some settler figures were among those who publicly condemned the desecration of the mosque. Ironically, the Israeli media seemed to be much more interested in the incident than the Palestinian media. At one point, it appeared as if the number of statements of condemnation coming out of the Jewish state exceeded the number of denunciations issued by Arab and Islamic governments and parties. While Fatah and Hamas have been complaining and crying over the past week about the torching of a mosque in the West Bank village of Yasuf -- an act allegedly carried out by extremist Jewish settlers – where were Hamas and Fatah when Palestinians set fire to and damaged synagogues in Gush Katif following the IDF pullout from the Gaza Strip in the summer of 2005? Where were Hamas and Fatah when Palestinians repeatedly set fire to Joseph’s Tomb in Nablus over the past decade? Of course arson is a despicable and abhorrent assault on a holy site that requires all those who care about coexistence, peace and tolerance in the Middle East to strongly condemn it, and there should be no justification for any attack on any holy site, be it a mosque, church or synagogue. But those who remain silent or condone attacks on other people’s holy sites and religious symbols should be the last to raise their voices when a mosque is vandalized. Similarly, those who have denied other people’s religious and historic ties to holy sites and lands should also keep their mouths shut. Why hasn’t any Palestinian party of leader ever condemned acts of vandalism against Jewish cemeteries? Where were they each time a Jewish worshipper was stabbed or killed while on his way to a yeshiva, the Wailing Wall or the Tomb of the Patriarchs in Hebron? How come we didn’t hear the voices of Hamas and Fatah when Palestinians hurled stones at Jewish worshippers visiting Joshua’s Tomb in a village in the northern West Bank? And where were Hamas and Fatah when Palestinian demonstrators repeatedly hurled firebombs and stones at Rachel’s Tomb in Bethlehem [a site which even Muslims consider to be holy, referring to it as the Bila bin Rabah Mosque]?" Beverly Hills (myFOXla.com) - Director-producer Steven Spielberg received the Anti-Defamation League's highest honor Wednesday night at a star-studded gala where he was presented with the Democratic Legacy Award. The event was held at the Beverly Hilton Hotel. The Anti-Defamation League was founded in 1913 to fight anti-Semitism through programs and services that counteract hatred, prejudice and bigotry, according to the organization's Web site. Tony Valdez has more in this video report. Jeffrey Katzenberg and Kirk Douglas were among the Hollywood dignitaries in attendance at the presentation of ADL's America Democratic Legacy Award to Stephen Spielberg. "Stand with Us," a grassroots, pro-Israel advocacy group headquartered in Los Angeles, is hosting the second of two, major advocacy community events within 3-weeks of each other. On the weekend of Nov 13-15, the group organized an "Israel in Focus" seminar. College students attended a Friday through Sunday seminar in the Pico-Robertson area of L.A. On Sunday, the same lecturers gave a one-day, concentrated Community Conference. Elliot Chodoff spoke on "Israel's Strategic Threats." Itamar Marcus of Palestinian Media Watch showed incitement on Palestinian government TV channels. Activist Mrs. Roberta Seid presented a lecture entitled "Israel 101." British emigrant to Israel, Neil Lazarus, taught effective argument techniques against Israel-detractors. 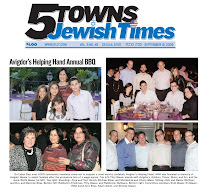 Marketing consultant David Suissa lectured on how to bring an "Israeli Voice to Your Community." 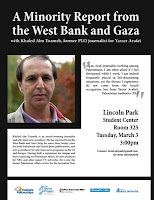 Stand with Us' publicist, Jennifer Kutner, shuttled Muslim Arab journalist, Khaled abu Toameh, who writes for the Jerusalem Post, between the academic and community conferences. Toameh thinks it is in the interest of the Palestinians to stop incitement, and he shared an Arab perspective on the subject. 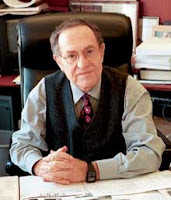 Harvard Law Professor Alan Dershowitz will give the keynote address at this year's Stand with Us "Festival of Lights" event being held Sunday, December 6th. Stand With Us' Festival of Lights - Israel U.N. Amb Dan Gillerman offers insights from 6-years inside the U.N.
"Can Muslim middle-east overcome bigotry towards Jewish Israel to thwart imperialist Iran?" Israeli UN Amb. 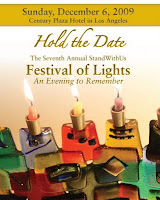 Dan Gillerman asks Stand With Us' Festival of Lights. "Ambassador Dan Gillerman professes optimism that the threats from imperialist Iran might motivate the Arab world to unite with Israel. He declares that Islamic militantism is as great a threat to moderate Muslims as it is to the general public - yet the Muslim world is not adequately routing-out militantism from its midst - to everyone's peril." A 25 year old Palestinian woman was sent to stab an Israeli soldier in a border check point. The woman was sent by a terrorist organization called Hamas, who are infamous for using woman and children as human shields, and as tools for terrorist attacks. In other cases, children as young as 10 years old were sent to the border with bombs attached under their shirts. This woman asked to enter Israel to seek medical attention. After a knife was found in her bag, the security officer went inside to check the bag. The woman then pulled out a second knife and stabbed a second security officer in the ribs.